The Tulpehaking Nature Center offers many programs that are noted on the calendar and schedule. Some are free and others have a modest fee. Please check to see whether registration is required. 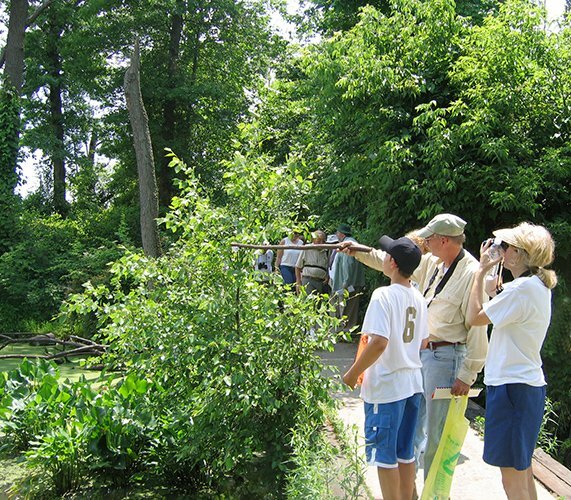 In addition, Friends for the Abbott Marshlands often in conjunction with partner organizations, such as the Mercer County Park Commission, Washington Crossing Audubon, the Central Jersey Sierra Club, or D&R Greenway, sponsor guided walks and paddling trips nearly every month of the year. Special programs include: a World Rivers Day (the last Sunday in September); history weekend – in April; and a celebration of May – American Wetlands Month. Guided walks may focus on special topics, such as birds, trees, wildflowers, dragonflies, beavers, or turtles, or have a particular focus like photography. Destinations of paddling trips, which begin at the boat launch at Bordentown Beach, may be the Watson Woods picnic area or Anchor Thread Park upstream of Yardville. Mercer County; Lock 1 of the Delaware and Raritan Canal, built in the 1830s; and Point Breeze in Bordentown, home of Joseph Bonaparte, brother of Napoleon. The Marshlands are within the Crossroads of the American Revolution National Heritage Area and is part of the Abbott Farm National Historic Landmark. See the Events Calendar for scheduled events open to all, usually free. To schedule a special guided trip for your group, contact info@abbottmarshlands.org.